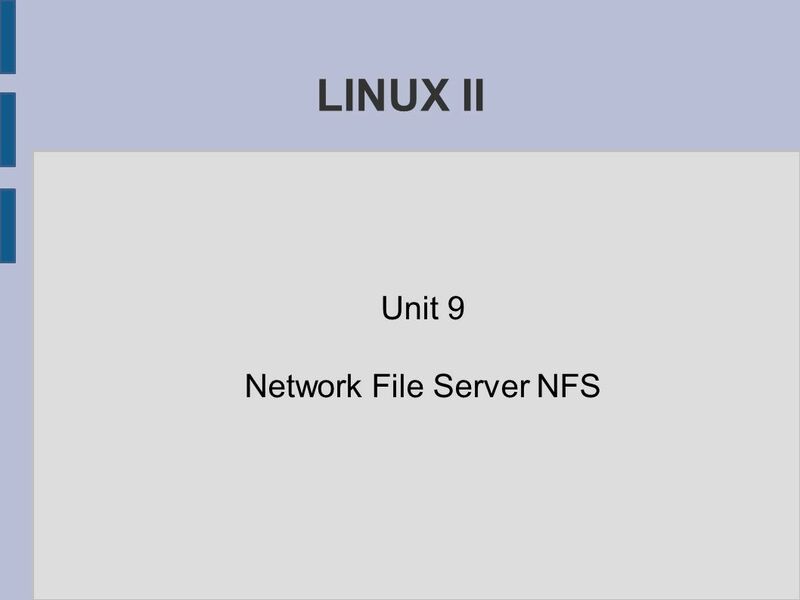 LINUX II Unit 9 Network File Server NFS. NFS Überblick ● Zugriff von lokalen Rechner über Netzwerk auf Dateien oder Ordnern auf entfernten Servern ● Entwickelt. 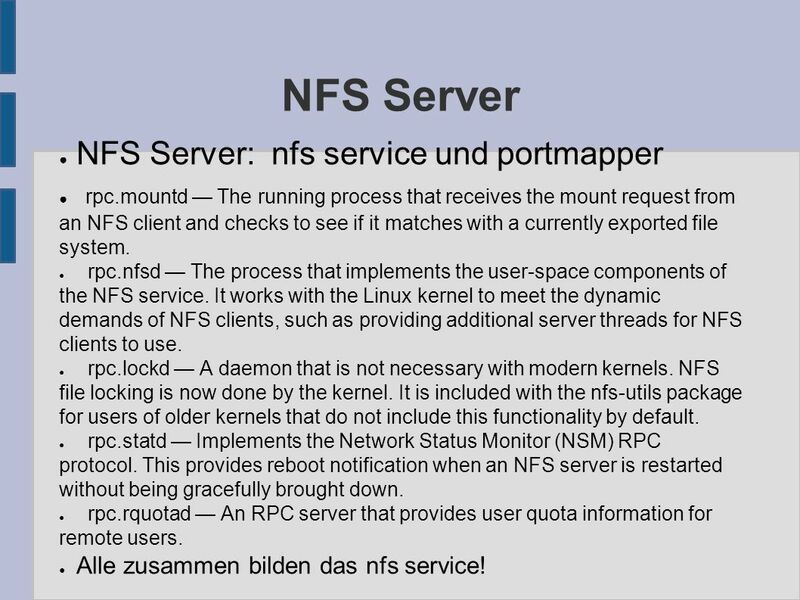 3 NFS Server ● NFS Server: nfs service und portmapper ● rpc.mountd — The running process that receives the mount request from an NFS client and checks to see if it matches with a currently exported file system. ● rpc.nfsd — The process that implements the user-space components of the NFS service. It works with the Linux kernel to meet the dynamic demands of NFS clients, such as providing additional server threads for NFS clients to use. ● rpc.lockd — A daemon that is not necessary with modern kernels. NFS file locking is now done by the kernel. It is included with the nfs-utils package for users of older kernels that do not include this functionality by default. ● rpc.statd — Implements the Network Status Monitor (NSM) RPC protocol. This provides reboot notification when an NFS server is restarted without being gracefully brought down. ● rpc.rquotad — An RPC server that provides user quota information for remote users. ● Alle zusammen bilden das nfs service! 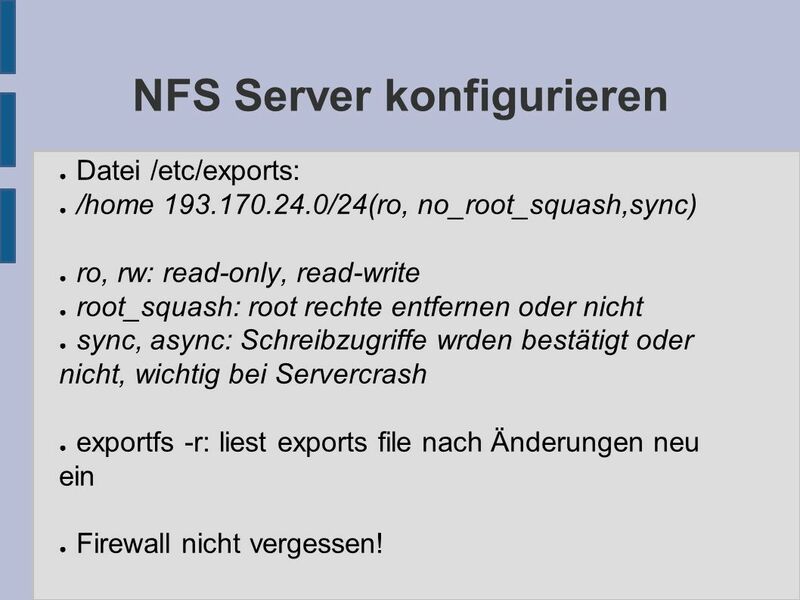 4 NFS Server konfigurieren ● Datei /etc/exports: ● /home 193.170.24.0/24(ro, no_root_squash,sync) ● ro, rw: read-only, read-write ● root_squash: root rechte entfernen oder nicht ● sync, async: Schreibzugriffe wrden bestätigt oder nicht, wichtig bei Servercrash ● exportfs -r: liest exports file nach Änderungen neu ein ● Firewall nicht vergessen! Herunterladen ppt "LINUX II Unit 9 Network File Server NFS. NFS Überblick ● Zugriff von lokalen Rechner über Netzwerk auf Dateien oder Ordnern auf entfernten Servern ● Entwickelt." Department of Computer Science Homepage HTML Preprocessor Perl Database Revision Control System © 1998, Leonhard Jaschke, Institut für Wissenschaftliches.